David Bowie | Cinema, etc. I recently enjoyed a brief holiday in the capital of Germany, Berlin. The city is rich with modern history and everywhere you look there’s a potential point of interest. I can honestly say it was one of the most educational and enriching holidays I’ve ever been on. No discussion of the political landscape of Berlin over the last 100 years would be complete without mention of the music scene that grew organically within the city from the late 1970s onwards that produced some of the greatest works of the era, inspired by the unique make-up of a city split in two and equally inspiring those living there. It is a music scene that also arguably helped to bring down the wall (or factually if you are the German Foreign Office). Spearheading the scene was David Bowie, who in 1976 was out of money and keen to break away from the LA drug scene that had facilitated his addiction to cocaine. It was there that he famously completed his ‘Berlin Trilogy’: Low, “Heroes” and Lodger , which kickstarted his career and helped him on his road to recovery. If you’re in Berlin and have an interest in David Bowie the you’ll definitely want to make sure you sign up to the Berlin Bowie Walk, operated by the Berlin Music Tours company. For a relatively small fee you will be guided around the famous city for around three hours, taking in the outside of the famous Hansa Studios (where he recorded throughout his time there); Potsdamer Platz (you can now get the train there! ); the Brandenburg Gate; the Reichstag, which was the site of his famous 1987 performance; and his flat in Schöneberg. If you’re feeling especially adventurous, you can return on a second day and visit the inside of Hansa Studio, standing in the Hall by the Wall and looking out from the former control studio through the window from the same spot Bowie where famously wrote the lyrics to “Heroes” – the precise details of which were debated by the many Bowie übergeeks during my tour. I’ve been purposefully scant on the details of the tour because I don’t want to ruin your enjoyment, but both sessions were truly special experiences and brought me closer to one of my favourite artists. The studio tour was actually Depeche Mode focused, but that wasn’t a huge problem. In fact, it was great to be able to learn a lot about a band that are surprisingly famous outside the UK. They recorded most of their most successful music at Hansa and this was clearly a pilgramage for many of those on the tour. They run several tours that are focused on different artists, including U2 and David Bowie. Sadly as yet Lou Bega hasn’t been given a tour yet . If I have one recommendation it’s that both tours overran on their expected finish time. This meant we got great value for money each day but if you have something else booked in (for example a visit to the Reichstag) then you should leave at least two hours at the end of the tour to do your next activity. On the walking tour you end up at Café Neues Ufer, which was a former favourite spot of Bowie and Iggy Pop to drink in – we ended up spending over two hours in there and didn’t want to leave! These tours are excellent value for money and packed full of anecdotes from people who are passionate about their subject. When that subject is David Bowie, it’s a no-brainer! The trilogy is often referred to as such despite Low being written prior to Bowie’s arrival in Berlin and Lodger actually being recorded in Switzerland. Lou Bega recorded his infamous ‘Mambo No. 5’ track in the late 1990s with some of the producers who now work at Hansa, a fact recognised by the double-platinum proudly on display in the lobby area of the studio. Wow, those pants are tight. Well, today started off on an awful note. I woke up at my normal hour after a particularly banal dream to a string of texts from a variety of people, many of whom hadn’t been in touch for years. I immediately knew something was awry. Scrolling through the messages, I pieced together that something had happened to David Bowie. Whether it was good or bad news wasn’t immediately obvious. The first was actually from my mum. “Have you seen the news about Bowie?” it read. My immediate hope was that he would be touring again – it was nice my mum thought it was such urgent news! This was ambushed by the slow realisation of what had happened. He wouldn’t be touring again. He had passed away after an 18 month battle with liver cancer. Devastated just doesn’t cover it. The following is going to be a cathartic and self-indulgent diarised memory of me discovering David Bowie as an artist, character and chameleon. David Bowie has been a part of my life for a very long time. I would still be classed as a relative newcomer to the party. My first memory of him was listening to ‘Little Wonder’ on one of those cheap compilation double CDs that were the rage when I was younger. This isn’t his best song by a long way, though it is a great example of him producing something special and cutting edge in a genre previously unfamiliar to him. At the time, of course, I didn’t really think that, though I was probably influenced by the fact the CD didn’t even list him on the front cover of the album as one of the top artists (Gina G, 3T and Mark Morrison did make the cut). He was just some old guy doing weird dance music that I didn’t understand. As time went on, I began to see his influence more and more. Oasis covered “Heroes” as the b-side to ‘D’You Know What I Mean?’ in 1997. Nirvana covered ‘The Man Who Sold The World’ for the MTV Unplugged in New York album, which I picked up when I reached my angsty phase (which lasted, all told, about six months). I was absorbing the snippets I was hearing but not really taking the bate. When the album Heathen was released in 2002, it had a quality that finally made me take notice. The song ‘Slow Burn’ was a regular on UK radio stations and that alone convinced me to pick it up. It was Bowie’s 22nd album but it was my first Bowie album. Sitting alongside Gemma Hayes, Elbow and Doves, my year in music was certainly very melancholic and reflective; the tones reflecting the mood of the world in 2001 when most of the songs were written and recorded. This formed the soundtrack to my A-Level studies. Slowly working backwards and learning more and more about Bowie, I was able to reward my patience with a thorough look at his different periods as I discovered them. This was a deliberate choice. That’s one of the great things about discovering an older artist – they usually have years of releases that you can pick up as you read more about them. So if, as I did, you get stuck on Hunky Dory for a whole year, then you don’t need to worry as the other 20+ albums will wait for you to finish with it. As time progressed, I become progressively more aware that everything had gone quiet on the Bowie front. After two albums in quick succession (Heathen was followed shortly after by 2003’s Reality), I’d managed to sweep up the last of the Bowie albums by around 2010. Somewhat inevitably this went to the much derided Never Let Me Down from 1987, an album that I felt had merits but lacked any reason to hold my attention beyond his better work. Now well versed in Bowie’s music, it dawned on me that the length of time he’d been away from the music scene could be construed as him having retired without really telling anyone. If he’s retired, then that meant he probably wouldn’t tour again. Had I missed my chance to see The Thin White Duke? Surely not. I began to think back to when I had considered going to see him during his Reality tour. My friends and I were debating which music festival to go to. The choice was either V Festival or T in the Park. We opted for the former, getting a day ticket to see Dido and Muse. Yep. That actually happened. As it turned out, Bowie pulled out of T in the Park due to ill health and he never toured again. I will forever regret never getting to see Bowie live. But it is something I have come to terms with over the last ten years. When Bowie announced a surprise album in 2013, it almost felt like a hoax. Out of the blue on 8th January, a new single titled ‘Where Are We Now?’ was delivered to radio stations across the world and played simultaneously. For a surprise return to the music industry, it was a far cry from anything that could be considered immediate or upbeat. This, I’d come to learn, was typical Bowie. Given that Bowie was now effectively a recluse, he had taken on the kind of godlike status usually afforded only to artists that had already passed away. Nobody thought they’d hear from him again. In a way The Next Day felt like the first posthumously released album put out during an artist’s lifetime. It was a wonderful present to fans old and new, many of whom were in the exact same boat as myself. Blackstar was announced in November and was set for release on 8th January 2016. It arrived with no special mention of what was going on behind the scenes. A couple of weird videos with a hard to decipher message, the usual Bowie-esque ambiguities in the lyrics. It is a fantastic album and I listened to it almost non-stop for the first weekend of release. Then on the morning of 11th January the news of Bowie’s death hit the world and suddenly the content of the album all fell into place. He had written and recorded his own obituary and released it to the world without anyone realising. And with that, Bowie confirmed himself as one of the most confident artists of all time. Who else in the history of music would look on his own death as his final chameleonic transformation? Today has been a day that may have started off in a depressing manner, but became one of listening, watching and consuming all things Bowie. It has been a completely beautiful experience. A sad but beautiful experience. David Bowie has made a career out of reinventing himself. In his early days, it felt like he was creating personas simply to discard them at the peak of their popularity: The Thin White Duke, Aladdin Sane, Ziggy Stardust and, most famously, Cobbler Bob. He didn’t simply create the characters – he lived them. The belief he had in these characters seeped into the psyche of the general public in a way no other popular artist has achieved since. Whilst these great creations don the designs of shirts the world over (or maybe just in Camden and Topshop), and at least one has become ironically infamous, many of Bowie’s ventures and guest appearances have fallen by the wayside, perhaps a little too weird for the average Bowie fan to comprehend. Here’s a countdown of the weirdest and most wonderful Bowie moments over the years. Whilst Tina Turner’s popularity arguably hasn’t followed the same trajectory as David Bowie, in 1987 she was a big crowd-puller and on a par with Bowie. Pairing the two together after the ill-fated Michael Jackson commercials was a match made in heaven. Unfortunately David Bowie was accused of sexual assault during his Glass Spider Tour and although all charges were later dropped, so was the advert seen above as Pepsi panicked about being associated with a high-profile court case. It’s a huge shame because the ad, which riffs on the 1985 John Hughes film Weird Science, is a great piece of pop music history. Yes, that’s right. In 1999, Eidos released a not-very-popular title called Omikron: The Nomad Soul on PC and, later, Dreamcast. David Bowie had a considerable amount of input into the storyline and design, plus he provided several songs for the soundtrack (most of which were reworked for his then-upcoming album Hours… or released as b-sides for the associated singles). In addition to performing in the in-game band The Dreamers, he features as Boz (see the above video), a mystical figure that appears digitally at various points in the game. It’s hardly Bowie’s finest moment but worth seeing to imagine what it felt like in 1999 when these graphics were cutting edge. I think if you’ve got this far down the article and you’re still reading you probably have already seen the famous video for “Space Oddity”. If you’re in any way interested in the history of Bowie, you’ll recognise the persona in this video as Aladdin Sane, which Bowie had assumed for his sixth studio album in 1973. However, on 2nd February 1969 David and his then-collaborator John Hutchinson recorded a video using an earlier version of the song, and that’s what you can see above. It’s quite different and entertaining in its own right, and a fairer reflection of what he was like at the time the song was recorded. By 1973, Bowie was a completely different person and his backing band had changed, so it’s nice that there is preserved a more accurate visual representation of the track. Back in 1984, David Bowie was riding high off the back of one of the most successful albums of his career, Let’s Dance, which hit number one globally to positive critical reviews. Such was the popularity, a decision was made to rush-release a new album, Tonight, which featured three covers and a couple of collaborations. 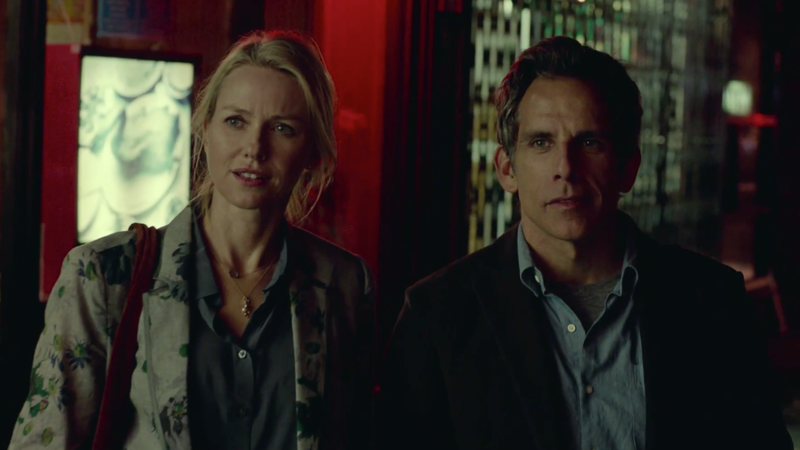 Sales-wise it was successful, but poorly-received critically. One curiosity from it is the promotional video produced for the song Blue Jean. 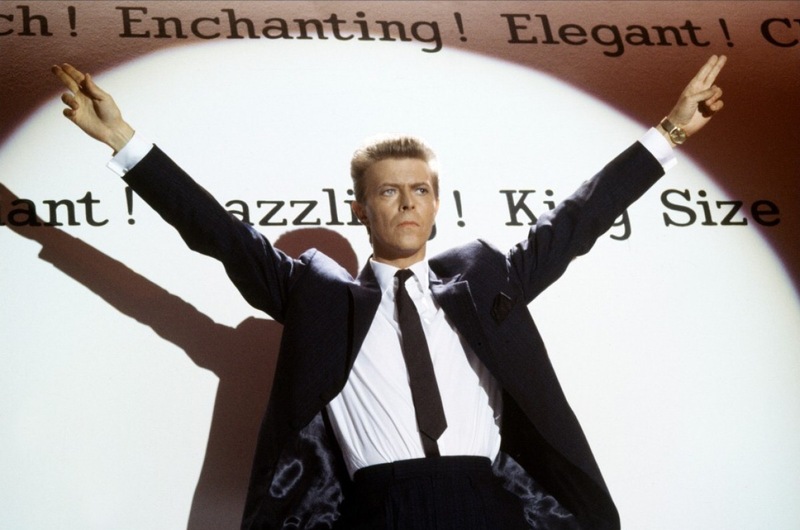 Clocking in at over 20 minutes, Jazzin’ For Blue Jean allowed Bowie to explore his acting abilities under the guidance of British filmmaker Julien Temple. Unfortunately, the results were less than impressive. In it, he plays Vic, a window cleaner desperate to impress an unnamed girl played by Louise Scott. To win her heart, he pretends to know popular musician Screaming Lord Byron (also Bowie) and takes her on a date to see him perform. It’s going through the motions for the most part the performance of the song as Byron near the end is vintage Bowie. Perhaps that’s why it was cut into a three-minute conventional video for use on MTV. It’s a tough watch now but worth checking out if you are really keen. We all love the Labyrinth. It was a childhood favourite of mine and in many ways hasn’t really gone into the ironic standing I’m sure it assumes for most people. After all, it’s a great fantasy storyline, the soundtrack is actually fantastic and it has David Bowie in it. What’s not to like? I’ll tell you what… if you take the track “As The World Falls Down” out of context and lay out the facts (as Bowie sings lovingly into the eyes of the girl he’s kidnapped, with those extremely tight trousers on, remember Jennifer Connolly was fourteen when this was filmed) it makes for interesting reading. Well, I’m being purposefully sensational here. There’s nothing terrible here. It’s a great song by a great artist in a great film. Stop fretting. “Too much is never enough”, according to Billy Idol at the end of this video. David only appears briefly at the start of this video, but it’s still a wholly bizarre experience. Well worth 30 seconds of your life. I remember the first time I heard The Laughing Gnome. It was particularly hard to track down for a quick listen: unavailable on YouTube or any of the streaming sites, the only way I could reveal the hilarity was to purchase it as part of the self-titled 1967 Deram album David Bowie – and even then only on the 2010 deluxe two-disc version where it nestled on the second disc (it strangely wasn’t actually included on the original album despite being one of the singles taken from it). It’s a shockingly awful novelty record that isn’t in keeping with anything else he produced before or since; even treating it as a children’s song you have to worry about how many of the puns would be understood by a child (for example, the “London School of Eco-gnome-ics” is mentioned). It is often misquoted as being Bowie’s first big hit, though it didn’t trouble the top of the charts until he’d achieved mega-stardom as Ziggy Stardust, reaching #6 in 1973 (six years after its original release). So it’s highly pleasing to see the above video, taken from 1999’s Comic Relief push, where Bowie reveals a new song titled “Requiem for a Laughing Gnome”. It’s a song played exclusively on a recorder, “with choreography”, and a message pops up with a threat that it will continue for four hours unless the public donates more money. It’s always great to see interviews with Bowie from about 10-15 years ago – he’s actually a lot more sociable and friendly than most people imagine he will be. In Bowie’s very first television appearance at the tender age of 17 – as Davey Jones – he talks about the Society for the Prevention of Cruelty to Long-Haired Men (presumably SPOCTLHM, pronounced spock-tull-hum”). It’s obviously a publicity stunt to get his face on TV, but a piece of rock history nonetheless. Whilst on hiatus between 2003’s Reality and 2013’s The Next Day, Bowie hardly made any appearances in public. However, in 2006 he found time to act in Christopher Nolan’s film The Prestige as Nikola Tesla. It was a pretty bizarre moment when I noticed this as I’d not seen the film at the time and had forgotten he was in it. He does a pretty good job too. Great film, great ending. Back when Christopher Nolan was good.